Neil Gaiman has won many literary awards, including the Newberry, Carnegie, Hugo, and Nebula. He is known for his comics, his novels, his screenplays, and his short fiction. When it comes to putting pen to paper (or more likely fingers to keyboard), he does it all well. Trigger Warning is a collection of short stories, with a few poems thrown in as well, that demonstrates the breadth and power of a master at work. Fans of other works by Gaiman will find familiar characters and settings in some of the stories. Black Dog features Baldur “Shadow” Moon, a character from his novel American Gods. Gaiman won a Hugo for his Doctor Who episode “The Doctor’s Wife;” in Nothing O’Clock, Gaiman returns to the Doctor, the TARDIS, and Amy Pond. Although not traditionally associated with Gaiman, The Case of Death and Honey tells of an elderly Sherlock Holmes nearing the end of his life…or is he? Gaiman’s stories travel the lines between fantasy and horror, science fiction and possibly some other genre uniquely his own. They are dark and sometimes macabre, not in an overtly bloody or gruesome way but in the psychological way where the road to your own fears is marked and your imagination takes you down the paths that make you shudder. 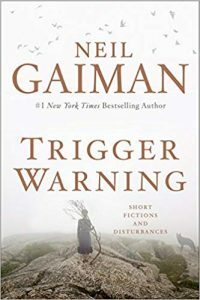 Gaiman warns us in the title that he is going for triggers. Believe him. An example. Click-Clack the Rattlebag starts so gently. A man visiting his girlfriend meets her younger brother. The younger brother wants him to tuck him in and tell him a story. I read this over Thanksgiving, spending time with my wonderful granddaughters. They like grandpa to read them stories. I like to read them stories. I did not read this one to them–I know that Neil Gaiman is not the go-to source for bedtime stories for toddlers. This story started so gently, so sweetly. A young man, bonding with his girlfriend’s family. Except, that is not what the story is about. The hints are there, near the beginning. Even if I did not know about Neil Gaiman’s work, even if it were not in the middle of a collection called Trigger Warning, the indicators could almost have been in all-caps: THIS STORY IS GOING TO GO SIDEWAYS AND CREEP YOU OUT! 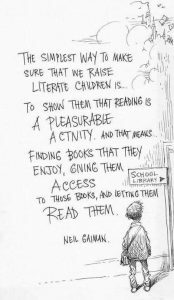 I don’t want to give too much away, but let me say that later in the evening when my older granddaughter wanted me to read a story to her, I thought twice about it! This may not be the right book for every reader. For those who love fantasy, horror, and great writing, it is an excellent choice. One thing I love about short story collections is they can be read in small pieces. One story now, another tonight, pick it up later in the week. Skip around, come back to it later. It’s worth the time, and the goosebumps. Share your favorite book or reading quote here.